Angular, React, and Vue: What's Coming in 2017? In 2014, hardly anyone knew about Vue.js. It was then considered a framework for the niche, however, now developers compare this to other established frameworks like Angular or React. Also Read: Vue.js Is Good, But Is It Better Than Angular Or React? 38706 Github Stars in which 26,000 has been increased in 2016 only. 21,424,759 pageviews on Vuejs.org page with a 470% increase in 2016. Official launch of Vue.js version 2.0 in September 2016. Vue.js is 3rd most starred project in 2016 on GitHub. This growth of Vue.js has attracted many developers to switch from other established frameworks. From the various feedback from Twitter, it looks like the Vue.js team has decided to focus more on testing. They plan is to provide more guidance in the docs and official testing utilities that make it easier to test Vue.js components. As time passes Vue.js environment is getting bloated and very difficult to navigate and evaluate. In 2017, they decided to curate this with a higher standard and provide much more detailed information for each project included. In 2017, there will be revamped documentation, API improvements, and a better onboarding experience in the Native Rendering based on feedback from the community and large-scale production use at Alibaba. Vue.js team is planning a conference in 2017. Though the dates are not final, yet they have released a survey to get your feedback on it. 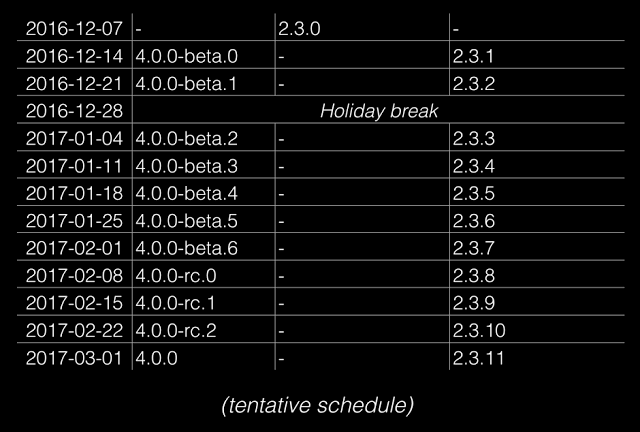 The Angular team at Google has made a few significant changes to the framework in the past year. Here's a glance of what's happened. The major change that we experienced the past year was a complete revamp in Angular 2 from the first version. After 2010, it was the first big news from the Angular team and it took the Angular popularity to new heights. Not left behind Angular 1 versions (1.5 and 1.6), steadily adding to one of the most popular frameworks. Plans for 2017 are to continue steady improvements on 1.6.x. 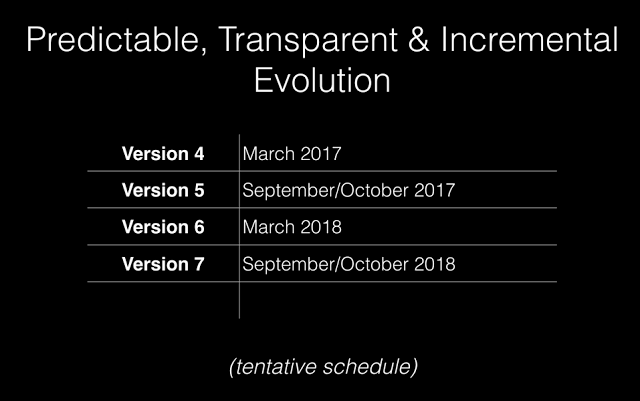 Major changes in versioning scheme. From 0.14.7. to 15.0.0. This states that the year was quite successful for React indeed. However, there's a lot more to come in the next year. However, Dan Abramov says that “there is still quite a bit of work to do,” but that it should land in version 16.0 or 17.0 of React. This is going to be a drastic change in the core algorithms of React just like Angular did while releasing its second version. Also Read: AngularJS vs ReactJS : What’s good for your business? Facebook hopes to enable “web apps with 60 fps and animations” with the major React Fiber update in 2017. This article was originally posted on ValueCoders.